*There are 2 shopping centers within 10 minutes, and the "Ala Moana Shopping Center," the largest shopping center in Hawaii and ranked 7th largest shopping center in the United States, is within 30-45 minutes. * Stroll on six miles of white sand beach, surf, swim, and snorkel. * Go sightseeing, visit busy tourist Waikiki, shop for 'things Hawaiian,' visit Polynesian Cultural Center, then come home to the cabana, swimming pool (not heated), and barbecue. * Enjoy the morning sunrise peeking over the horizon and glistening ocean waves. We have had this Beach property for many years and love it. The main house is right on the 6-mile white sandy beach. One mile to Kailua Town. Direct view of the beach and ocean. One step to the white sandy beach and ocean. Lawn chairs available to use on the beach. 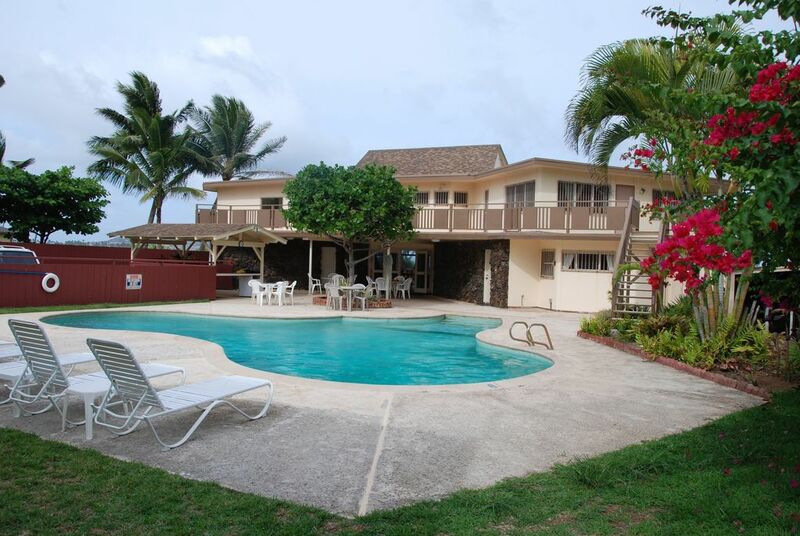 The main house is just steps away from a six-mile white sand beach in a peaceful quiet area. Enjoy the sea breeze and the sea waves on the sand.